It's all about the confidence. At first glance, it might look like there was a half price sale on red cloth and denim at the RNIB day centre, but in reality we're just stylishly acquiring sunburn. I've always said that Lisa's face lights up a room, but frankly she's looking radioactive. As is our daughter. I've seen pregnant royals going through labour with less of a glow. You'd think they'd been on a weekend break to Chernobyl. Anyhoo, as the photo above demonstrates, the radiant beauty of my family is keeping my mother firmly in the shade, but if you're wondering why there appears to be two of her, it's because the other one's my aunt. They have to wear different coloured skirts so that people can tell them apart. Especially as they both cooked my Sunday lunch. I didn't know which one to order a drink from. 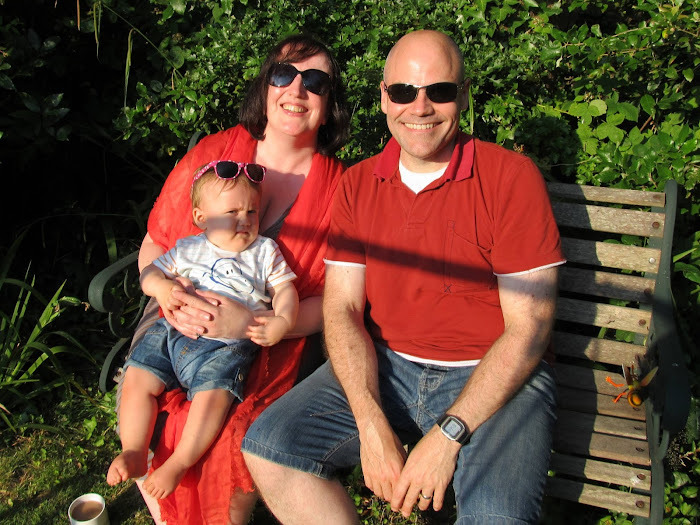 My giddy aunt lives in the peat bogs of East Anglia, and hasn't been this far south since last August when Toby was a young-looking babe in my arms. As was Lisa. But she's currently staying at my parents' house for a few days, which is why we made the journey over there yesterday. The result was a relaxing Sunday spent sitting in my parents' garden, and wishing we had more than a bit of fake grass on a balcony. 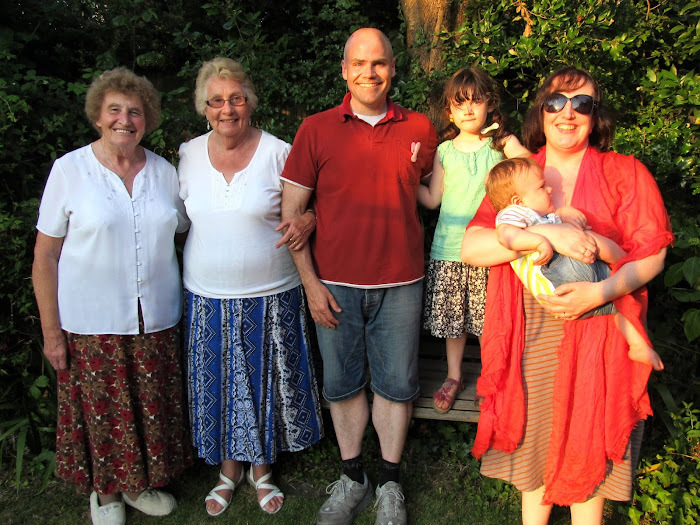 Although, as my Mum pointed out, hers takes a bit more work. Let's face it, it's not every lawn that requires less than two minutes a week with a Dustbuster. 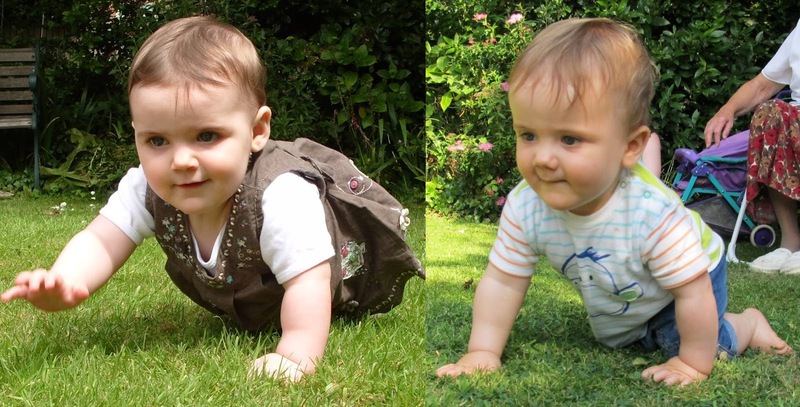 That's Amelie on the left, in June 2009, and on the right is Toby yesterday. There's clearly quite a difference in height. The grass on the left is much taller. But you can tell the pair share the same genes. Not to mention the same pudgy arms, and a hairstyle modelled on Hitler. It's just that Amelie got there sooner. She was less than 8&half; months in that photo, whereas Toby's almost one. It's becoming clear that she'll always look down on him.